Six pieces of jewellery and a silver and enamel pill box by Norman Grant acquired by Aberdeen Art Gallery and Museums in 2015 with an NFA grant of £1,587. In May 2014 I wrote a post on a brooch and pendant by North East Scotland’s own Norman Grant, acquired for our collection with NFA funding. 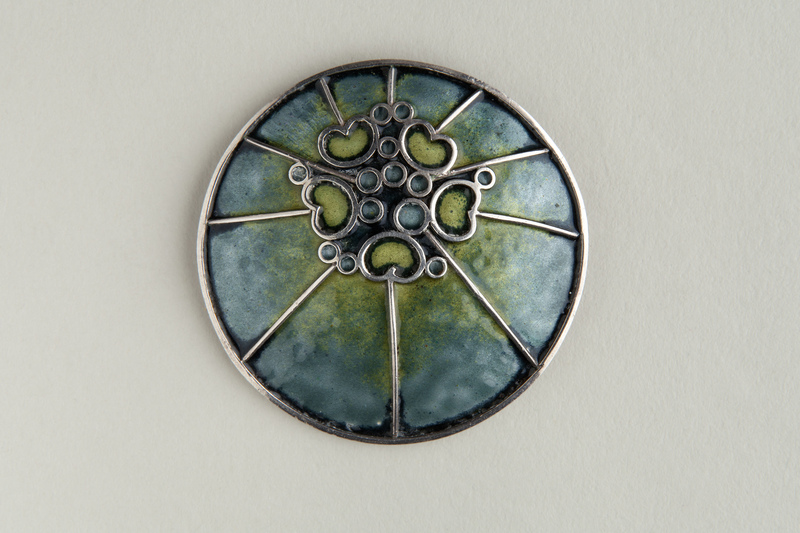 With our increased knowledge about the pieces Grant created, and access to his original sketchbooks and designs, we have acquired seven other examples of Grant’s beautiful enamelled work, again with NFA support. Norman Grant was born in Forres, Moray in 1943 and studied at Gray’s School of Art in the 1960s. He was a student of David Hodge who established a goldsmithing and jewellery course at Gray’s in 1954, leading the department until he retired in 1975. Hodge remembered Grant as one of the students who made his teaching career memorable. In the late 1960s Grant began to design jewellery, initially working in a shed in his garden. 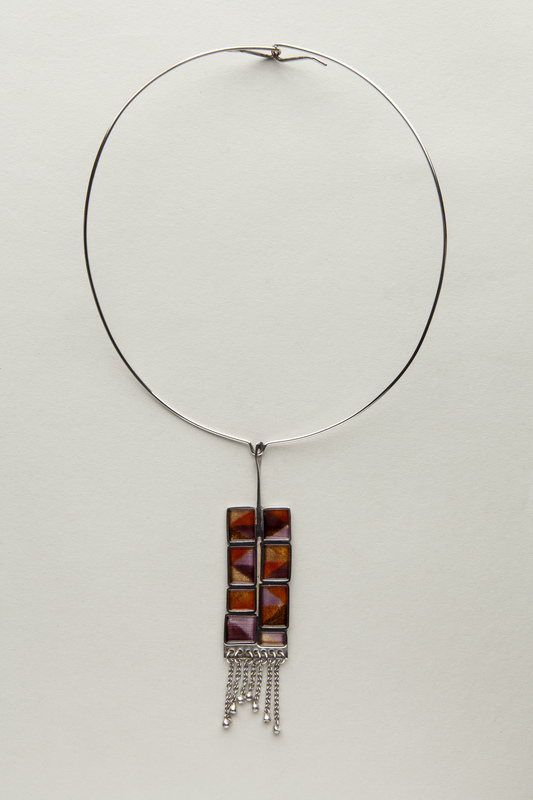 His preferred medium was translucent enamel which he combined with sterling silver. The comparatively low cost of materials enabled him to be experimental in his work while keeping the cost to the customer reasonably low. 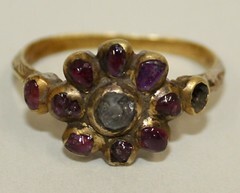 Knowing that to be successful he had to sell, Grant showed examples of his work to local jewellers and was surprised when all the pieces sold in one morning. Right away Grant found himself working full time to complete orders and within a year the popularity of his work was assured. With its psychedelic colours and Pop Art patterns, his jewellery reflected the fashion and style of the period. Having initially studied graphic design before switching to silversmithing, Grant often maintained that he was influenced by the natural forms of the coastal landscape he had grown up with. Inevitably these influences found their way into his early jewellery designs; microscopic plant cell structures, petals, stamens, seed heads, trees, driftwood, shells, seaweed, anemone-like forms and later fish, wave and cloud motifs can all be seen in his work. 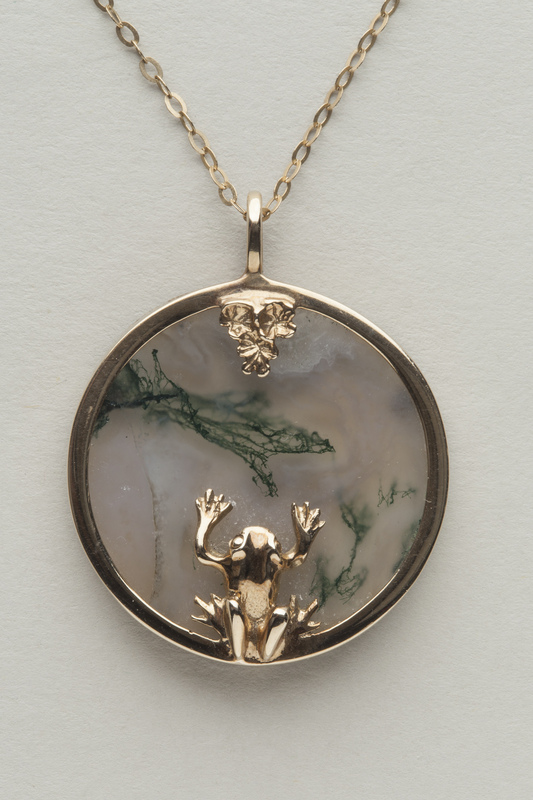 Gold and Moss Agate Frog and Lily Pad Pendant is an example of Grant’s later work and reflects his love of the natural world. Not only does the pendant incorporate a frog and lily pad but the pond is made from a piece of pale moss agate. Scottish moss agates are primarily found in Fife where Grant’s workshop was established, forging another link with the geology of the area. The pendant and chain are made of gold although Grant worked predominantly in silver during this period. 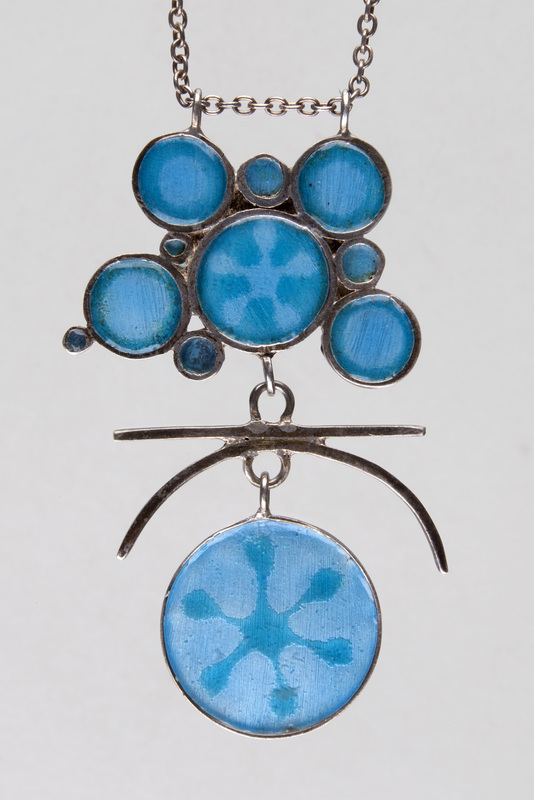 Often Grant’s designs were made up in the workshop by one of his silversmiths but we know that Stickleback Motif Blue Pendant was made by Grant himself. Grant’s original design brochures feature this pendant as design number PG17. The piece is finished in vitreous glass (kiln-fired) enamel in translucent shades of cobalt, aqua, and sky blue set within the silver cells which form the abstract outline of a stickleback fish and give the pendant a kaleidoscopic effect. Rock Pool and Reflections Pendant, made in 1978, is a variation on the theme of ‘organic’ designs. We now know that the ‘silver and enamel pendant’ featured in my last post should more correctly be called Rock Pool Pendant. The two are linked in their circular form, redolent of areas of sea water contained by the rocks around them. Eight Enamel Panelled Necklet is part of the ‘Mexican Blanket’ series which also includes the enamel brooch discussed in my previous post. It has been a very rewarding process to work with some of the original design sources in order to positively identify the prototypes. The series derives from the traditional Mexican saltillo (or serape) blanket design which dates back to the Chichimeca people of pre-colonial times. The necklet is formed of eight irregular panels of coloured enamel with silver borders and seven ball and chain features suspended below. The pendant is attached to a thin silver torque. It was made in 1972 at a time when Mexican culture was becoming increasingly popular as a result of the social, political and cultural Chicano Movement. 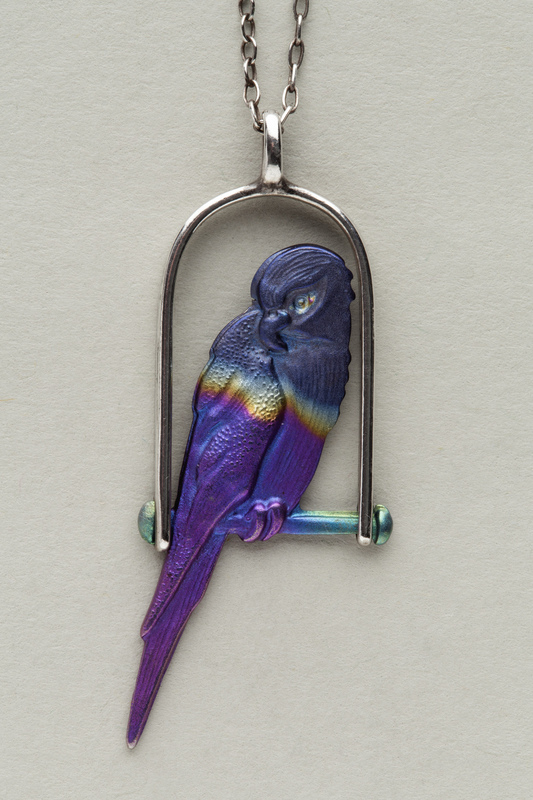 Silver and Titanium Parrot Pendant is from Grant’s ‘Titanium Futuristic Jewellery’ collection of the late 1970s and early ’80s which included pendants, earrings, brooches and bangles. This is very different in style to his earlier work. Titanium jewellery became fashionable during this period as designers sought to move away from more traditional metals. Developed for use in the aerospace industry, titanium is a light, strong metal that can be anodized to create a variety of vivid colours. This is achieved by passing an electric current through the metal. 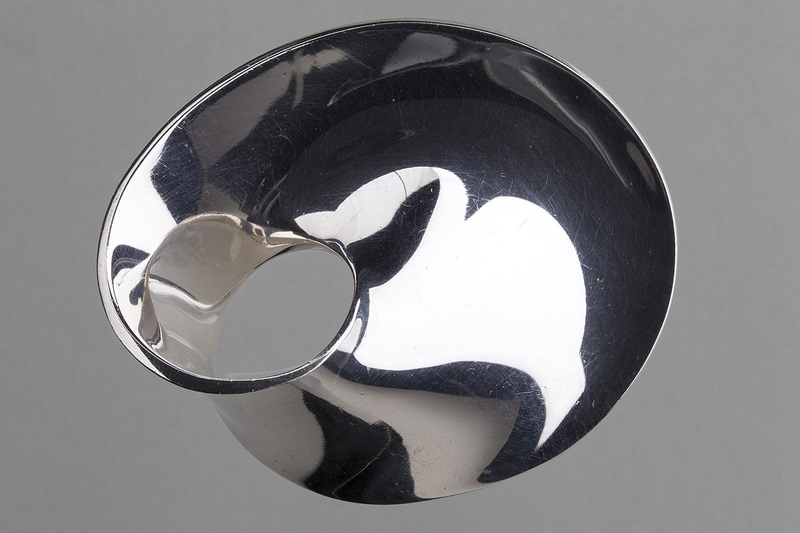 The parrot was one of the most difficult pieces of titanium jewellery made by Grant owing to its curved and uneven surface which exacerbated the difficulty of making titanium adhere to silver. Later titanium pieces by Grant are often unmarked and can only be identified by style. The parrot pendant, however, bears Grant’s ‘NG’ punch mark. 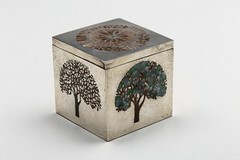 This small pill box is one of a limited edition. 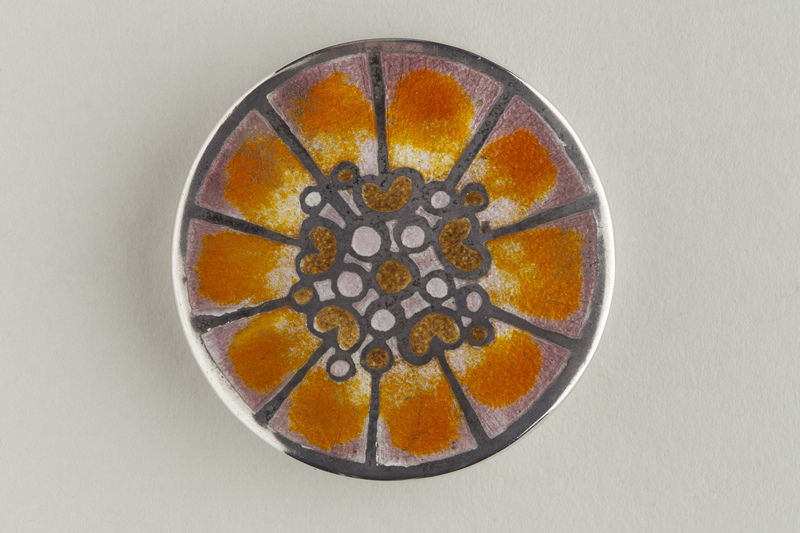 The decorative enamel lid suggests a cross-section of a plant, the granulated orange and pink sections similar to the cells of a seed head. Similarly, Honesty Brooch/Pendant illustrates Grant’s fascination with plant life. Whereas the structured lines or septa of the pill box are formed of grey enamel, the septa on the brooch forming the structure of the cross-section are slightly raised ridges of silver, the enamel poured in around them. Support from the National Fund for Acquisitions has allowed us to continue to acquire pieces by this creative and highly individual designer and to increase our knowledge of his design methods, his breadth of style and the ideas which inspired him. The year 2016 marks the centenary of the birth of Sir Robin Philipson (1916-1992), one of Scotland’s most celebrated and distinguished artists. Between 1965 and 1996 the National Fund for Acquisitions supported the purchase of artworks by Philipson for eight Scottish collections. They range in date from 1958 to 1987 and include oil paintings, a gouache design for a poster for the Edinburgh International Festival and a design for a tapestry. Born in Broughton-in-Furness, Cumbria, Philipson moved to Scotland with his family in 1930 at the age of 14, settling in Gretna and becoming a pupil at Dumfries Academy. He went on to study at Edinburgh College of Art from 1936 to 1940. By the time he graduated Britain was at war and Philipson joined the King’s Own Scottish Borderers, seeing action in India and Burma. Philipson’s wartime experience had a profound influence on his art and two of the paintings acquired with NFA support explore this theme. Oil on canvas, Fallen Soldier, c1966, acquired by Paisley Museum in 1966 with a grant of £125 (NFA.2774). Picture credit: Paisley Museum, Renfrewshire Council. © The Artist’s Estate. Oil on canvas, The Attack, 1961, acquired by Fife Council in 1965 with a grant of £157.10s (NFA.1147). Picture credit: Fife Cultural Trust (Kirkcaldy Galleries) on behalf of Fife Council. © The Artist’s Estate. In 1965 Philipson wrote to the curator of Kirkcaldy Art Gallery, William Hood, with a fascinating account of the inspiration behind The Attack. He described the execution as both difficult and exciting because he was ‘discovering the expressive possibilities of a new way of painting’. He went on to explain how he found inspiration in the tone and colour of photographs and how he contrasted the powerful image of the dead soldier in the foreground with the vignette in the upper right corner of the canvas which depicts ‘a battle scene as portrayed in the grand manner by a 19th century French painter’. Philipson’s message was essentially pacifist; the key to reading the painting lies in the contrast between these images. ‘I had hoped’, he wrote, ‘the observer would be able to read simultaneously the irreconcilability of the glorious vision and the terrible reality’. (Letter from Philipson to William Hood, dated 16 November 1965, Fife Cultural Trust Collection). After the war Philipson returned to Edinburgh where he undertook a teacher training course at Moray House. He joined the staff of Edinburgh College of Art in 1947, first as a librarian then lecturer, eventually succeeding William Gillies (1898-1973) as Head of School of Drawing and Painting in 1960, a post he held until he retired in 1982. Philipson belonged to the Edinburgh School, a loose grouping of artists many of whom had studied and/or taught at Edinburgh College of Art. They included Gillies, John Maxwell (1905-1962) and Anne Redpath (1895-1965). The earliest of the artworks acquired with NFA support was a design for a poster for the Edinburgh International Festival. Gouache on paper, Design for a Poster for the Edinburgh Festival, 1959, acquired by Aberdeen Art Gallery and Museums in 1996 with an NFA grant of £1,100 (NFA.711). Picture credit: Aberdeen Art Gallery & Museums Collections. © The Artist’s Estate. Although the composition, featuring the Scott Monument and a drummer, was used for Philipson’s poster for the 1958 Festival, he changed the date to 1959, perhaps suggesting that he considered reusing the design the following year. Certain themes emerged in Philipson’s work: war, cockfighting, church interiors, a series of paintings depicting the Crucifixion. An example of the latter, in the unusual medium of oil, tempera and gesso on canvas, was acquired by Dundee City Council with NFA support in 1980. Oil, tempera and gesso on canvas, Crucifixion, 1960/80, acquired by Dundee City Council in 1980 with a grant of £625 (NFA.3011). Picture credit: Dundee City Council (Dundee’s Art Galleries and Museums). © The Artist’s Estate. Although Philipson originally painted Crucifixion in 1966, he worked on it again in 1980, changing the blue palette of the original by adding yellow sections to either side of the rose window and darkening the ground behind Christ to shades of grey and brown. Crucifixion was intended to be hung above eye level, forcing the viewer to look up at the tortured figure of Christ, emphasising the suffering conveyed in the splayed fingers, stretched arms and tormented face. The painting also conveys Philipson’s interest in ecclesiastical architecture which he explored in a series of church and cathedral interiors. These are often characterised by a bold use of colour and heavy impasto. The NFA supported the acquisition of an example from this series, Iconostasis, for the collection of Lillie Art Gallery. Titles occur and recur in Philipson’s work. The word ‘threnody’, which refers to a poem, song or speech of lamentation, is included in the titles of a number of paintings including Threnody Meeting which was acquired with NFA support by the Andrew Carnegie Birthplace Museum in 1970. Detail of oil on canvas, Threnody Meeting, acquired by the Andrew Carnegie Birthplace Museum in 1970 with an NFA grant of £190 (NFA.1391). Picture credit: The Andrew Carnegie Birthplace Museum. © The Artist’s Estate. In spite of Philipson’s teaching commitments and his public roles – he was President of the Royal Scottish Academy from 1973 to 1983 and was knighted for service to the arts in Scotland in 1976 – he was a prolific artist who constantly explored the boundaries of his art, pushing himself to achieve better expression and greater technical mastery. He believed that to be an outstanding teacher it was essential to be a practising artist, fully engaged with his art. In 1983, just after Philipson retired from Edinburgh College of Art and stepped down from his role as President of the Royal Scottish Academy, his role in Edinburgh’s artistic life was recognised by the acquisition of a painting for the city collection. Oil on canvas, Zebra, acquired by City of Edinburgh Museums and Galleries in 1983 with a grant of £975 (NFA.4077). Picture credit: City Art Centre, Edinburgh Museums and Galleries. © The Artist’s Estate. A new departure in the last year has been the artist’s interest in pictures within paintings. Zebra is the first in this series, uniting elements such as an animal painting with the accoutrements of a studio, allowing a combination of details which would otherwise be unusual. Levels of reality suddenly appear and coexist in the tradition of baroque painting. The subject was inspired by a travelling scholarship which Philipson undertook to South Africa and Kenya in 1976. The zebra was to appear again in a tapestry woven by the Edinburgh Tapestry Company after a painting in Philipson’s Humankind series. Cotton warp and wool tapestry, Humankind, 1988, interpretation of an original design by Sir Robin Philipson, woven by the Edinburgh Tapestry Company. Acquired by Glasgow Museums in 1992 with a grant of £8,312 (NFA.3843). Picture credit: CSG CIC Glasgow Museums Collection. © Dovecot Tapestry Studio. Philipson wrote of the title that it ‘needs to stir a train of thought by its sound as much as its sense. The name ‘Human Kind’ – all kind involving humankind – was proposed by George Bruce, hoping, as he says, that a word will take the viewer into the painting’s heart’ (Robin Philipson Retrospective, Edinburgh College of Art exhibition catalogue, 1989). The specific theme of this painting is apartheid, set within the landscape of South Africa and showing the love of a white boy for a black girl. The quality of this wonderful tapestry arises from the robust and enthusiastic relationship that developed then, between the master weavers and Sir Robin, and their shared commitment to producing a vibrant work in tapestry that responded to the nature and the passion of the painting, the ideas it represented and the way in which they were portrayed. The tapestry took on a life of its own. It began and continued to develop through rich and detailed discussions between the artist and the weavers about the abounding, opulent diversity of colour, shape and texture; the psychology of seeing, sensitivity and understanding; the perceptions of cultural sensibilities; and the politics of art. Yarn and woven sample trials were produced and, while the original painting was available for a very short time, work progressed in relation to exceptionally good slides and Sir Robin’s frequent visits. The subject of the painting expresses the humanity evident in Philipson’s work throughout each phase of his long and successful career as both a teacher and artist. It is worth noting that Glasgow City Council chose this work from its collection to send to the G8 Summit at Gleneagles in July 2005 as an expression of support for the aims of the 31st summit which focused on debt relief and aid for Africa. With thanks to Lady Diana Philipson for permission to reproduce the artworks. Half-hull model of the clipper ship Thermopylae built in 1868 by Walter Hood & Co, Aberdeen, acquired by Aberdeen Art Gallery and Museums in 2015 with an NFA grant of £6,820. Meredith Greiling writes about the significance of the acquisition while Jason Finch has some useful advice gained from his experience of bidding for the model at auction. She is in every respect a fine specimen of naval architecture, a model of symmetry and beauty; her sweeping lines and exquisite proportions, her graceful outline and general compactness, conveying an idea of perfection. This quote comes from an Australian newspaper account of the maiden voyage of the new Aberdeen-built clipper ship Thermopylae which had just completed the fastest recorded voyage for any sailing ship from the Port of London to within sight of the Australian coast in just 59 days. Clipper ships were fast sailing vessels, built at a time when steam technology was beginning to dominate sea travel. Based on a design by the Aberdeen shipbuilders Alexander Hall & Sons, the distinctive sleek shape of the clipper ship’s bow became world famous as the ‘Aberdeen Bow’. Their size and speed meant these ships were ideal for carrying compact but valuable cargoes such as tea from China. There was a prize for the first ship back to London with that season’s harvest and very soon the ‘Tea Races’ became front page news around the world. The ships and their masters became household names and the phrase ‘Aberdeen-built’ was a mark of distinction. 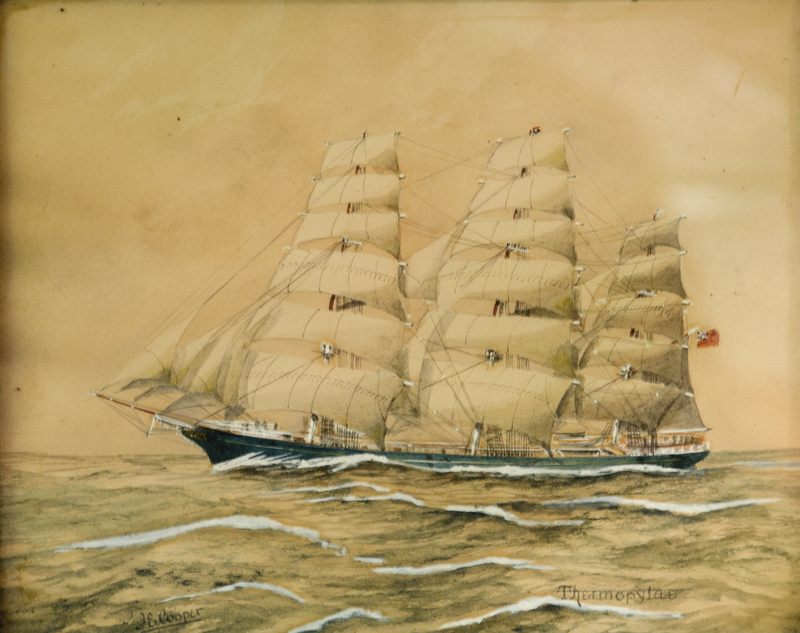 Thermopylae was built by the Walter Hood shipyard in 1868 at the peak of the China tea trade; a year later the Cutty Sark was built on the Clyde to compete with her. In 1872 the two ships raced from Shanghai back to London. Thermopylae won by seven days after the Cutty Sark lost her rudder. The original shipbuilder’s model of Thermopylae, in private ownership since it was made and therefore unavailable to academics and enthusiasts, has now been purchased at auction with the support of the National Fund for Acquisitions and Friends of Aberdeen Art Gallery and Museums. The model will soon be on permanent public display at Aberdeen Maritime Museum; a tribute to Aberdeen’s shipbuilding heritage and the city’s most famous ship. Expect the unexpected. Charles Miller, a London-based maritime auction house, had asked if a model of Thermopylae on our website was part of our collection? They were selling the half-hull model and were checking what others were out there. Although we had a chronometer associated with Thermopylae, purchased with a grant from the National Fund for Acquisitions in 2003, we didn’t have anything relating to its construction so decided to bid for this model at auction, something we hadn’t planned to do! Sort the finances. To bid we needed financial help so we submitted an application to the NFA. The Fund offered to meet 50% of the cost and we would match that with support from the Friends of Aberdeen Art Gallery and Museums. Remember when bidding at auction that buyer’s premium and VAT will be added to the hammer price (ie, your final bid). Explain yourself. I know what a half-hull model is and why Thermopylae is important but not everyone does. Explain the significance of the proposed acquisition in any grant application. If you’re unsure of the telephone bidding process, ask! Charles Miller was very helpful and ensured I knew what to do. Also, make sure they understand your procedures for paying to prevent misunderstandings later. Be calm and ready. I was extremely nervous on the day, not sleeping well the night before, and was caught off-guard by the speed of the initial bidding, having to wait for it to slow down before joining in. Shout about getting it. After our successful bid we put out a press release and got a lot more coverage than we expected, including requests for radio interviews. Collect it! It’s easy to get caught up preparing for the auction but remember to arrange to collect your acquisition … and factor that into your costs. Two silver brooches made by Georg Jensen, Shooting Star, 1970, designed by Henning Koppel and Möbius, 1968, designed by Vivianna Torun Bülow-Hübe, and a silver and enamel brooch, 1971, and silver and enamel pendant, 1978, by Norman Grant, acquired by Aberdeen Art Gallery and Museums in 2012 and 2013 with three grants totalling £800. Since stepping into post here at Aberdeen Art Gallery as Curator of Decorative Arts I have had the great good fortune to have been heavily involved in making discerning purchases of metalwork for the collection. 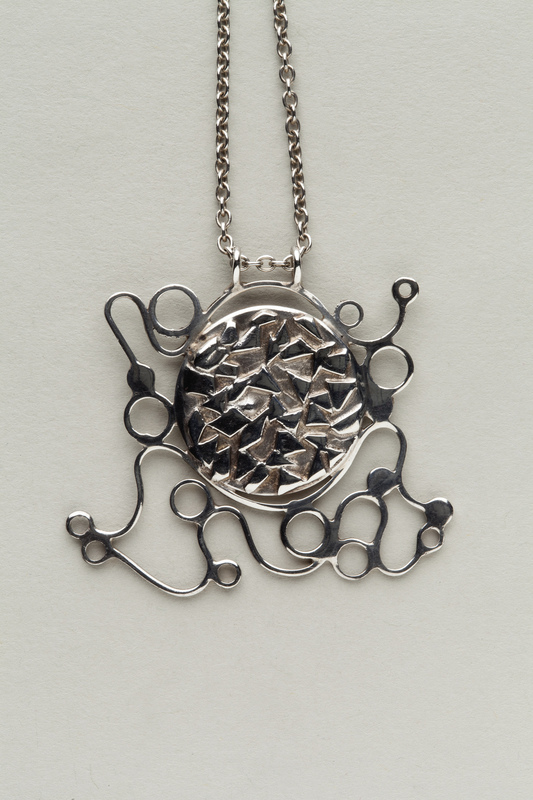 The purchases have focused on items of silver jewellery made by artist/craftsmen and women in the 20th century. Each piece epitomises the style of its respective era and could easily be discussed in the context of the architecture, interiors, fashion and popular design of the time. 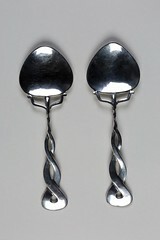 Two brooches by the firm of Georg Jensen, dating from the late 1960s, were designed by different ‘in house’ designers. 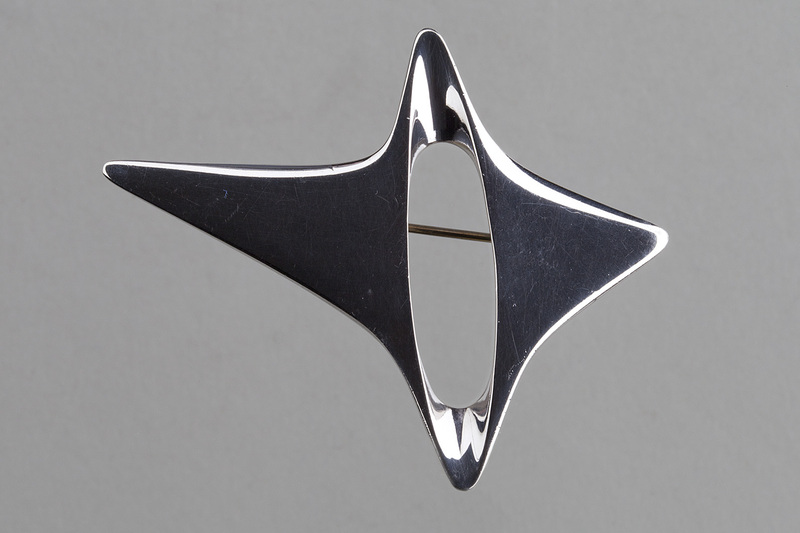 Henning Koppel (1918-81) collaborated with Georg Jensen over many years and designed the amorphic Shooting Star brooch while Vivianna Torun Bülow-Hübe (1927-2004) designed the iconic Möbius piece. Both pieces are symbolic of what we have come to associate with the classic simplicity of Scandinavian design. Both the Georg Jensen brooches are manifested in the work of architect Eero Saarinen who invoked suggestions of flight in his designs for the terminal at Dulles International Airport outside Washington DC and the TWA Terminal in New York, both finished in 1962. 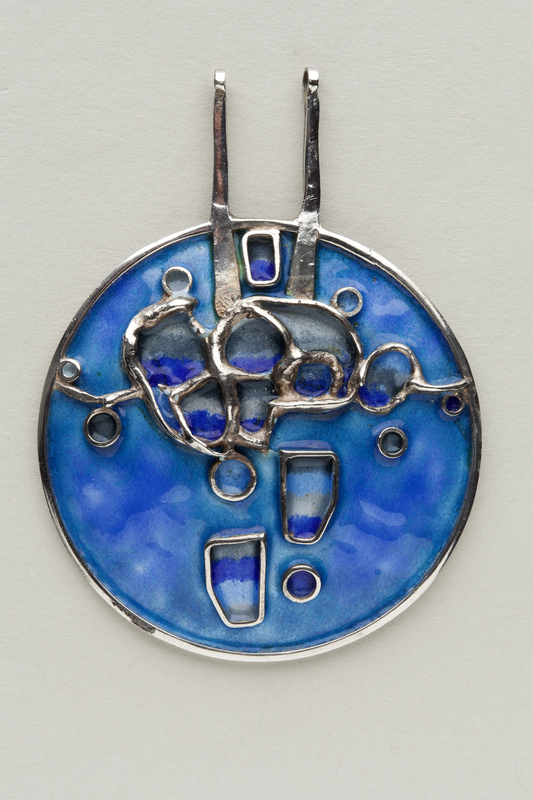 Norman Grant designed and made both this enamelled brooch and pendant. Grant was born in Forres in 1943 and studied at Grays School of Art in Aberdeen, initially in graphic design before diversifying into silversmithing. His early pieces were colourful and derived inspiration from both organic and pop art forms. His trendsetting work acquired ‘must have’ status in the mid-1970s, worn by celebrities such as Sandy Shaw and Mick Jagger. 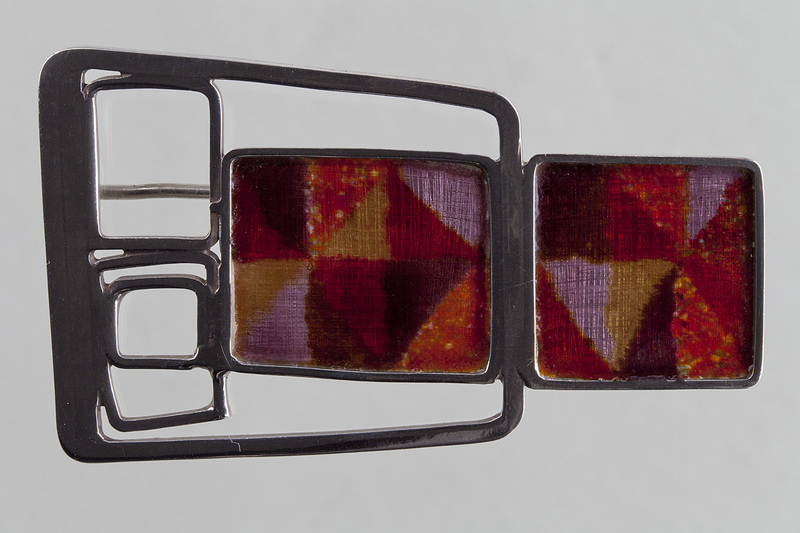 Grant’s jewellery with its emphasis on earthy colour tones and irregular arrangement of shapes echoed those of the textiles designed by Bernat Klein (1922-2014), a number of whose garments are also in the collection at Aberdeen. Klein’s inspiration was derived from nature and the colours found there; often the seemingly haphazard juxtaposition of colour blocks made the most natural combinations. The NFA is ecumenical in its approach to financial assistance – it supports the acquisition of modern and contemporary pieces as well as older historic ones. The NFA really fosters and supports the sense of purpose which Aberdeen Art Gallery has in common with many other galleries and museums; to continue to collect both actively and selectively. 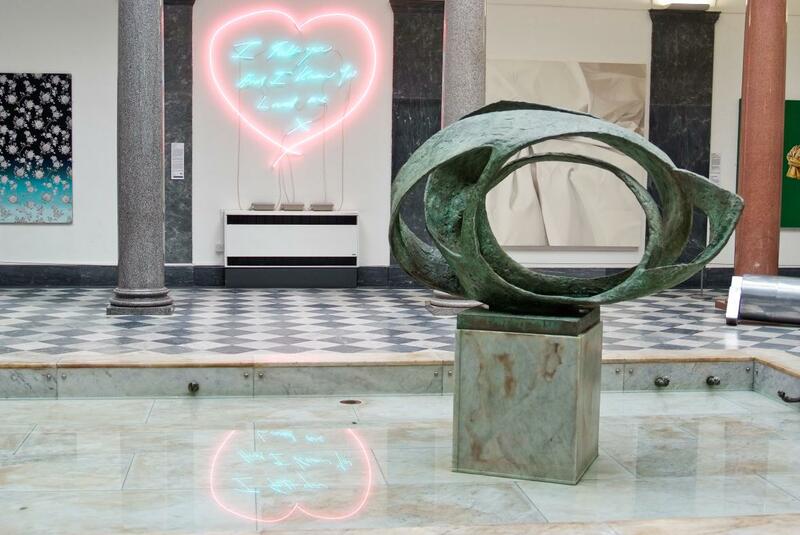 Bronze on marble sculpture, Oval Form – Trezion, 1962-3, by Barbara Hepworth, painted bronze sculpture, Habitat, 2004, by Gavin Turk and hand blown glass, pink and blue neon artwork, For You, 2008, by Tracey Emin, acquired by Aberdeen Art Gallery and Museums in 1965, 2004 and 2009 with NFA grants of £1,200, £20,000, and £13,500 respectively. Challenging, exciting, dramatic, witty, fun or serious and above all superb quality – these are the hallmarks of contemporary fine art collecting at Aberdeen Art Gallery. Ever since its inception in 1885, the acquisition of contemporary art has been its lifeblood. This first came about through the generosity of one our earliest benefactors, Alexander Macdonald, who left a fund to buy works of art which were not more than 25 years old. Subsequent curators built on this foundation and now – a regional art gallery perched on the edge of north east Scotland – we hold an outstanding collection of modern 20th century and contemporary art, with recent focus on sculpture, installation, conceptual art and new media. The National Fund for Acquisitions has long supported curatorial decisions to expand the collections in fresh and dynamic ways. Painted bronze sculpture, Habitat, by Gavin Turk. Artwork reproduced courtesy of the artist. 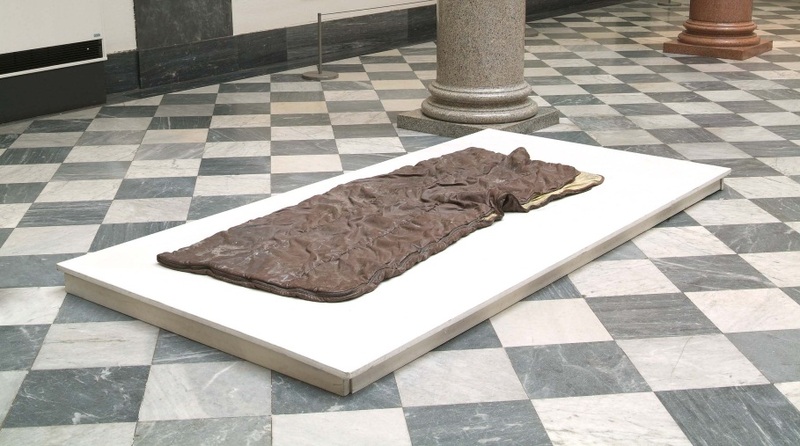 For some time now, the rather severe classical grandeur of Aberdeen Art Gallery’s Centre and Side Courts has provided the perfect foil to Post Modern works of art, for example, Gavin Turk’s bronze sleeping bag Habitat which appears both as a very realistic rumpled abode of a homeless person and an object of contemplation. Another purchase, Tracey Emin’s pink and blue neon love heart sign For You possesses a vista from halfway up the street approaching the Art Gallery, drawing you in through the front door. The sign also reflects in the pool in front , created by Barbara Hepworth in the 1960s to hold her marvellous bronze piece Trezion. The art of these two remarkable women works so well together proclaiming loudly to anyone walking in that this gallery is about great art – modern and contemporary.